Click the Contacts icon on the Navigation Pane. Double-click the contact name you want to view. In the ribbon, click Show. Click the Show drop-down list and select the type of item you want to view. The research of the linked activities to a contact can take one good moment if the contact has a long list of articles related to him. If that takes too long, you can constantly stop research by clicking on the key “STOP” on the right side of the table activities. 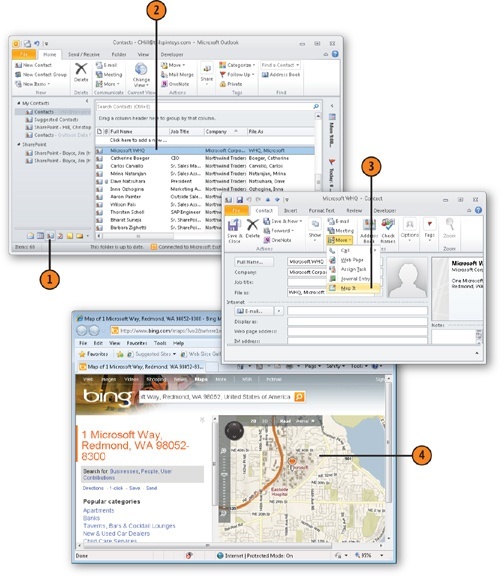 Double-click the contact for which you want to display a map. On the Contact tab of the ribbon, in the Communicate group, click More, Map It. Or click the Map It button to the right of the address field on the contact form. View the map in your Web browser. To see a map for an address, you must have Internet access. Not all addresses are available from the Bing Web site. If you can’t find the address you’re looking for, modify the information you enter on the search Web page. Click the Search button to begin the search again.